SPECIALE RACCORDO T2 ESTRATTORE DI FUOCO PER FOTOCAMERE REFLEX SU TELESCOPI NEWTON CON ATTACCO 31,8 . LA MAGGIOR PARTE DEI TELESCOPI NEWTON, NON CONSENTE LA FOTOGRAFIA IN QUANTO HANNO UNA CORSA DEL FOGHEGGIATORE MOLTO LIMITATA, TANTO DA NON PERMETTERE LA MESSA A FUOCO QUANDO SI UTILIZZA UNA FOTOCAMERA REFLEX. NESSUN PROBLEMA CON QUESTO ACCESSORIO CHE ESTRAE IL FUOCO AL FINE DI RIUSCIRE AD UTILIZZARE TALI APPARATI. SI INSERISCE AL POSTO DELL'OCULARE Ø 31.7 E DAL LATO OPPOSTO HA IL CLASSICO FILETTO T2 DOVE ANDRA' INSERITO L'APPOSITO TERMINALE T2 DEDICATO (DISPONIBILI PER LA MAGGIOR PARTE DELLE REFLEX). NESSUNA PERDITA DI QUALITA'. OTTICA ESTRATTIVA APOCROMATICA A 4 ELEMENTI SPAZIATI IN ARIA. QUESTO ACCESSORIO PUO' TRASFORMARSI UN UN BARLOW APOCROMATICA APLANATICA DA 3X PER OCULARI Ø 31.8 CON L'ADATTATORE "Raccordo per t2 a 31,8 " OPZIONAL articolo: 2758 . Nota: occorre avere il relativo attacco fotografico T2 ( disponibili su richiesta per ordinarlo richiedere preventivo di costo indicando la marca della fotocamera che si intende utilizzare. Special Link Extractor Of Fire For Photo REFLEX on Telescopes With Attack 31,8 Type NEWTON. THE MOST GREATER PART OF THE TELESCOPES NEWTON, DOESN'T ALLOW THE PHOTO IN HOW MUCH THEY HAVE A LIMITED RUN OF THE FOCUSES VERY MUCH, SO MUCH NOT TO BE ALLOWED THE MASS TO FIRE WHEN A CAMERA REFLEX IS USED. ANY PROBLEM WITH THIS ACCESSORY THAT EXTRACTS THE FIRE FOR TO SUCCEED IN USING SUCH APPARATUSES. Put Á. the Place Of the ocular Ø 31.7 And From the opposite side it has the classical fillet T2 where it is possible to insert the special terminal T2 for it (Available for the most greate part of the REFLEX), Therefore it allows to effect photographic resumptions with telescopes that have graft 31.8 Á. Configuration NEWTON. ANY LOSS OF QUALITY' EXTRACTING OPTICS APOCROMATIC . 4 ELEMENTS SPACED IN AIR. 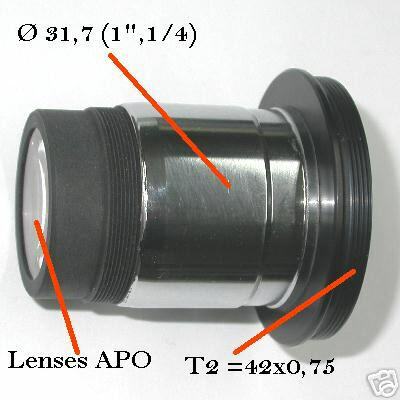 This Accessory can change itself in a APOCROMATIC APLANATIC BARLOW From 3X For eyepieces Ø 31.8 With The adapter "Link for t2 to 31,8 " OPZIONAL.